Size is everything, says Bluenose owner Bill Zelios. 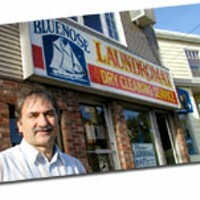 The Bluenose has 30 washers, from single to triple size, and all of their dryers are double size. “The main thing is people know if they come in they’ll find a washer. Number two, it’s very clean.” Zelios and his wife paint the laundromat every year, and clean it throughout the day so you don’t have to worry about finding someone’s cat or dog (or worse!) hair all over your towels. No wonder they win this category year after year.